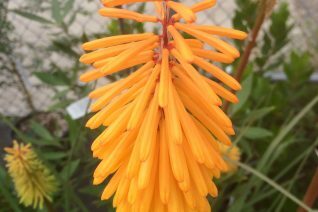 Cool, interesting and actually spectacular Kniphofia that has flowers more reminiscent of an Aloe. 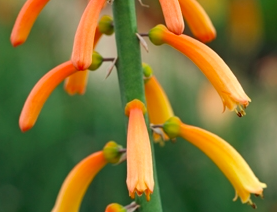 The 4′ spikes of blooms have tubular downward facing flowers that are not clustered together but rather separate. They range in electric hues from near red/orange to yellow. Forms a grassy clump of deciduous foliage that rises to just one foot high. Spreads by runners- NOT A CLUMPER- give it room to spread, a single plant will roam several feet in every direction. Full sun to very light shade and RICH, well drained soil with light but consistent summer water. Excellent cut flower and dearly loved by hummers. Emerges late in spring. Stunning poker with unusually colored flowers that are a kaliedescope of colors all within one spike. Opening tinted russet brown the expanding tubular flowers senesce to pale cream. 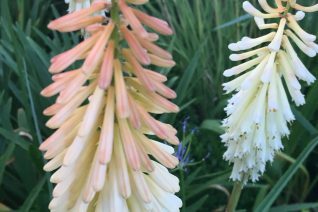 To 4′ tall in bloom and forming prodigious clumps in rich, well drained soil. Regular summer irrigation spurs rapid re-bloom which can extend well into autumn. A clump with multiple flower spikes is spell binding. Hummingbird food. A fantastic and dramatic large cut flower. Foliage is semi-deciduous. Apply an annual layer of compost and a handful of all organic fertilizer in spring to increase vigor, blooming spikes. Fantastic with the ornamental grass Pennesetum spatheolatum. And any ornamental grass for that matter. Full sun to partial shade. 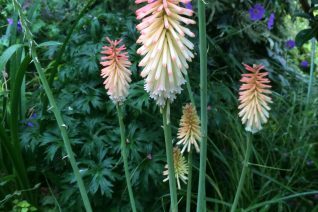 Superior re-blooming cultivar with glowing pale coral and cream flowers. 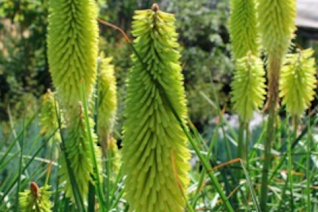 Forms expanding clumps of grassy foliage and begins sending up 28″ spikes of flowers in early June. Quick repeat of flowering occurs for two more months in rich, moisture retentive soil with good drainage. Add an annual application of compost to increase vigor spur rapid re-bloom. Wonderful, ethereal flower color that is at home with pink/orange Agastache and the pale lilac flowers of Tulbaghia violacea ‘Big Violet’. Winter deciduous. Full sun to very light shade. 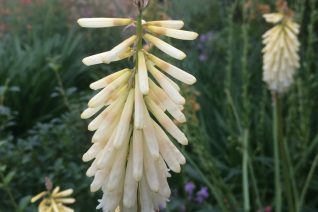 We selected this Kniphofia years ago for its nearly white flowers and habit of reblooming throughout summer. 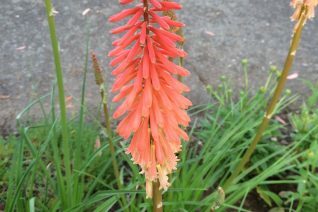 Flowers begin in late spring and rise to 30″ tall and continue to be produced periodically until fall rains arrive. Rich, well drained soil with regular summer water to re-bloom reliably. Apply an annual application of compost or all organic fertilizer to increase vigor, performance. Combines well with Agapanthus, Tulbaghia, Middle of the border. A nice contrasting bloom spike intermixed with subdued ornamental grasses. Remove spent flowers to encourage more. Slowly increases its clump size. Semi-evergreen.